Use indoors or out... Use to Hang swags across windows or as decorative door toppers. 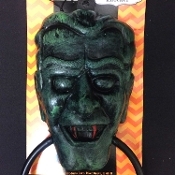 New with creepy red bloody fangs, dimensional spooky VAMPIRE GREEN FRANKENSTEIN MONSTER Head has a hole for hanging. Includes swinging knocker ring and worn weathered stone with black and green color scheme. Item is brand new with original packaging. Sturdy hard plastic Zombie Frankenstein Monster Head measures approx. 6.5-inch (16.25cm) inches without Hang-hole. Hoop approx. 6-inch (15cm) diameter, with metal ball bearing in back to make knocking sound on Door. Total approx. 11.5-inch (28.75cm) Long including round handle hanger ring.